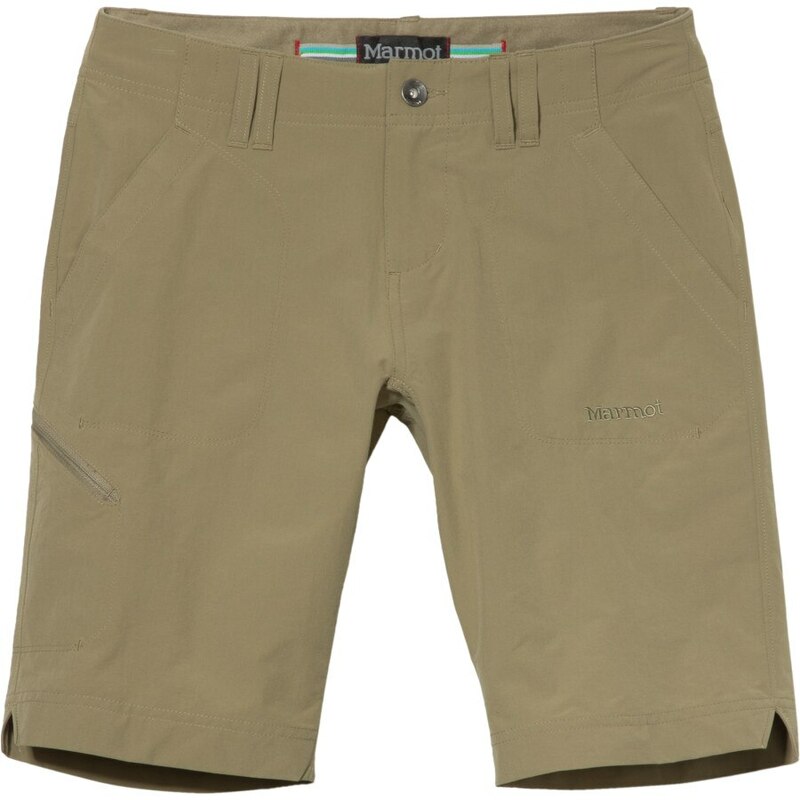 I have been snoop shopping for a good design for boardshorts and decided to adapt these Marmot Lobo’s shorts. My ideal boardshorts are short enough to swim in without a heap of baggy fabric, but long enough that I can stop off at the local cafe on my way to the lake and not feel too self conscious. The Marmot Lobo’s have slant pockets on the front and welt pockets on the back. There is also a small side pocket with an exposed zipper to hold a car key in. 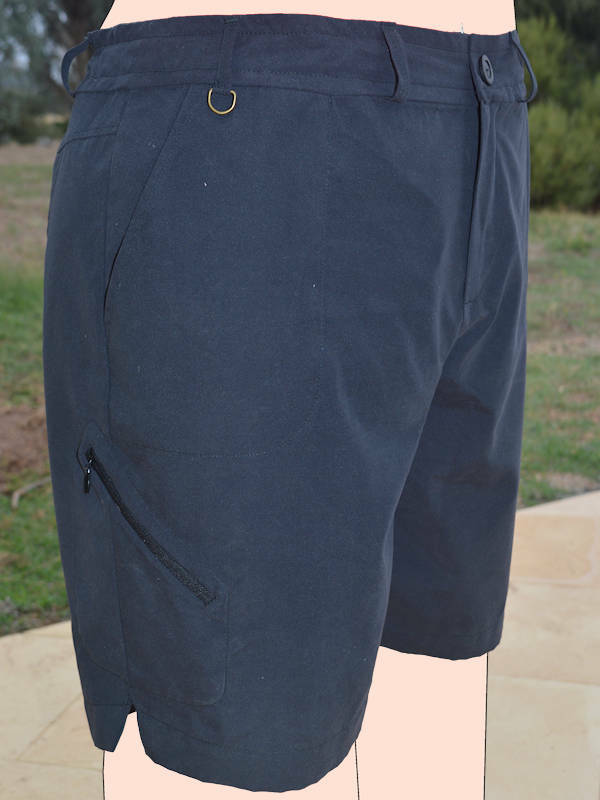 I like the style of these, especially the curved lines around the pockets . 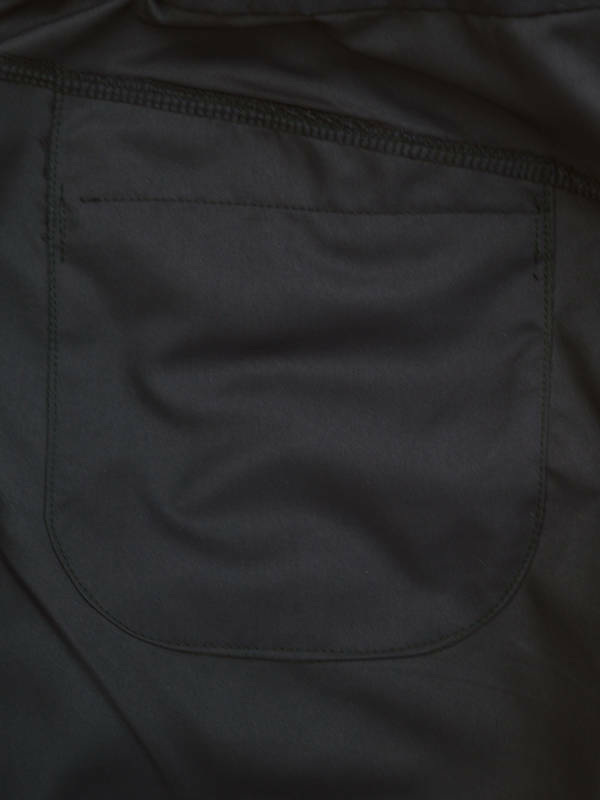 The outside looks fairly plain with a neat line of top stitching showing the line of the internal pockets. For the pattern, I used my TNT trouser pattern that has slant pockets and a darted back waist with welt pockets. 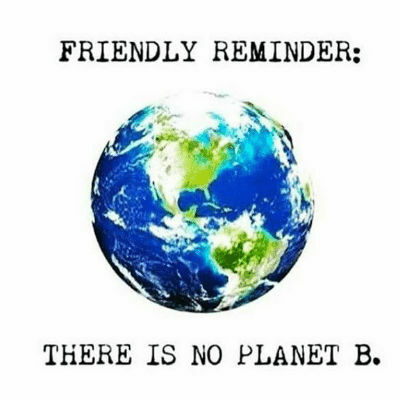 I made the following changes…. shortened the pattern to mid-thigh length and widened the leg by 3cm. I could have gone wider, but I didn’t want them to be too baggy in the leg. drafted front and back patch pockets with rounded corners. Back pocket extends up to yoke seam. drafted side pocket. This was a bit tricky to get the angles looking similar to the original design. Because I had shortened the legs, the proportions of the pocket also changed. I moved it a bit further around to the front to make it easier to get my hand into the pocket. The zipper is an invisible zipper. I toyed with making it in a contrasting colour ( burnt orange) but decided not to make a feature out of it. Please notice the semi-circular ends to the zipper opening – looks so good but is a pain to sew! Waistband has a channel to run an elastic drawstring on the inside. 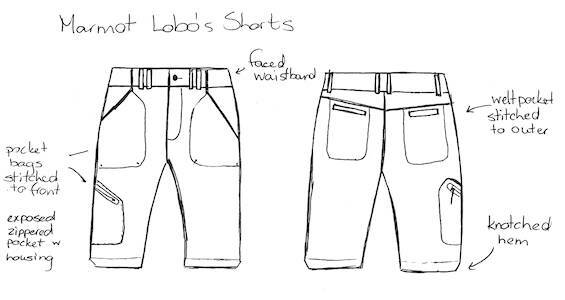 The drawstring ends near the front beltloop so the front waistband will remain flat. The end of the drawstring has buttonholes, which hook on to a small button inside the waistband. This allows the length to be adjusted without having the bulk of the conventional drawstring bow knot. It can be adjusted easily with one hand. I tried to make the tabs of the drawstring from self fabric but it was too narrow to sew the buttonholes onto. Instead, I used two strips of narrow ribbon, bar-tacked together at regular intervals to form button holes. used peachskin polyester fabric to they are quick drying. It is a charcoal colour, which was a pain to photograph well. It also collects fluff like you wouldn’t believe. To reduce bulk, I made the pockets as a sing layer patch pocket, sewn from the inside. I cut cardboard templates to help shape the curves of the pocket edge. 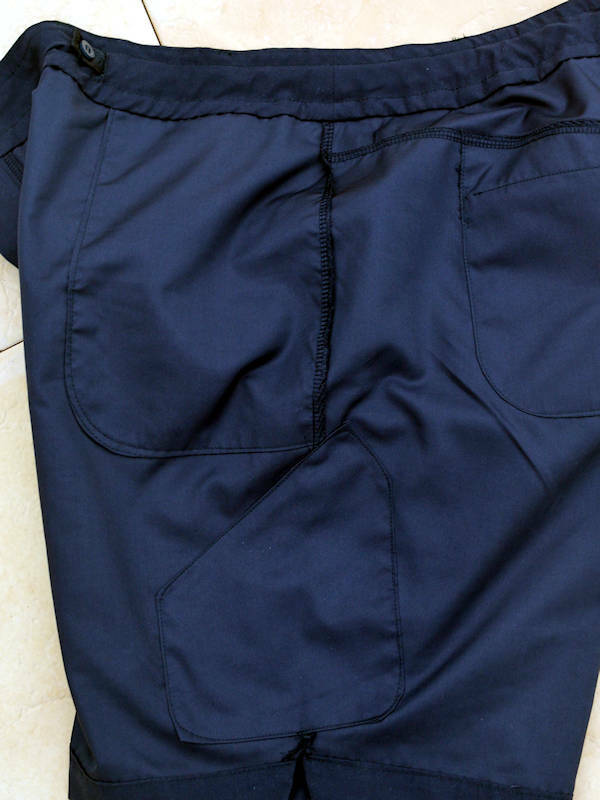 This also had the bonus of keeping the inside free from the normal overlocking around the pocket edges – so less chance of irritation from seams rubbing the skin when they are wet. This sounded good in theory but it created a lot more work to make sure that the pockets were even, and in finishing the edges of the openings as there wasn’t the normal pocket facing. I used narrow ribbon to finish off the inside edge of the pocket openings, being careful to cover the raw edges but not be noticeable from the outside. The back welt pockets were a nightmare but I like the finished look. added a D-ring to one of the belt loops to clip things to. I have a small underwater camera which I like to tether to shorts, just in case it gets dropped in the water. Passed on both accounts. The final shorts fit well and don’t look that much different from normal shorts. The work well in the water, not too baggy in the lag, and being able to snug the waistband up as the fabric relaxes. And they dry so quickly. 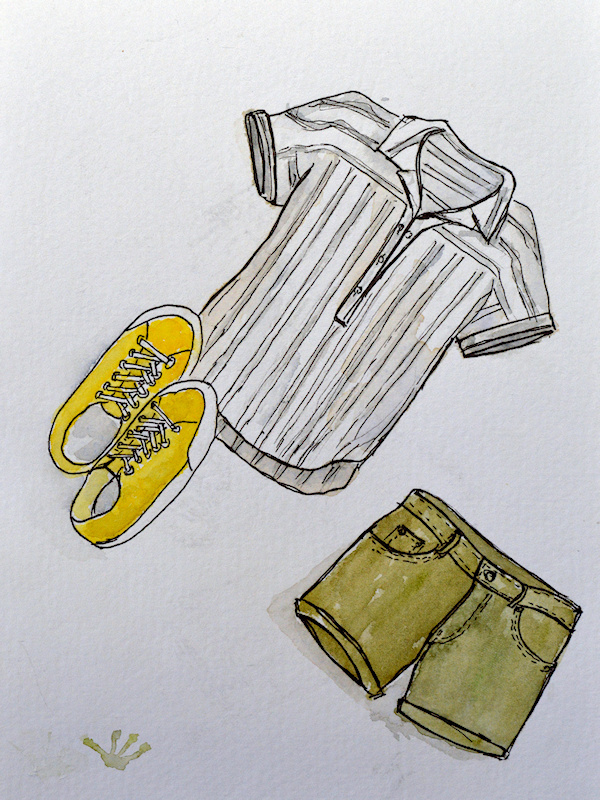 I’m already planning another version of these shorts, but in a textured cotton for everyday use. Difficulty 4/5 – pockets were trickier than they should have been but the end result is worth it. Cost $9 ( $6 fabric, $3 zips). Great work TF – love all the attention to the details. Fantastic result worth going the extra mile with the details, love your “draw string” option. These look fabulous and your pockets looks very smart.